Production is one of the keys to a successful dairy farm and many farms have turned to automation to achieve their goals. Milking robots such as the Lely Astronaut automatic milking system and automatic feeding systems such as the Lely Vector have helped increase production by making the barn the cow’s world. But how does herd health – and healthy hooves in particular – play a part in this? Being intentional with hoof health among heifers will give them the ability to last much longer through their milking years. Heifers that have had digital dermatitis lesions even once have a 45 percent chance of recurrence. That number jumps to 67 percent when they have had two or more lesions during rearing. That is not an insignificant statistic when you consider that lameness in dairy cattle is estimated to cost anywhere from $90 to $400 per cow and digital dermatitis accounts for about half of all those lameness costs. Cost of treatment, decreased fertility, milk yield loss and decreased longevity in the herd are all underlying expenses of lameness, not to mention the labor costs associated with treatment. The key to preventing those lameness costs is in early detection and treatment. This can help be accomplished by checking heifers as they enter the breeding pen at 10 to 12 months of age. Springing heifers and dry cows should also be assessed, treated and functionally trimmed as necessary three to eight weeks prior to calving. First-calf heifers and cows should also be assessed at least once, if not twice, during lactation. Secure footing with grooved concrete. Grooves should be spaced 3 1/4” center on center, ¾” wide and ½” deep with a 90 degree edge. Effective cow cooling during periods of heat stress, allowing cows to lie down rather than stand and congregate on concrete alleys. Routinely use foot baths. Size the foot baths correctly so cows have three dips of each hoof or six seconds of contact each time they walk through the baths. Footbaths should be 10 feet to 12 feet long, but only 20” wide. Solution depth should be 3.5 inches. Footbath alleys also should have solid sidewalls because cows will walk through them quickly without stopping. Healthy hooves are good for the animals as well as their production. 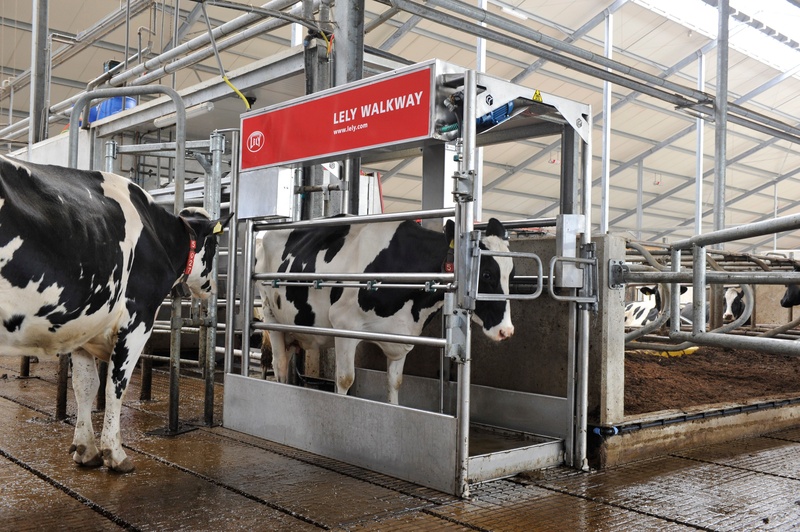 The Lely Walkway offers regular care for hooves with minimal labor from you. It is safe and easy to use; with a simple push of a button, the foot bath fills up with water and a hoof care product. The cows walk through the foot bath and obtain the efficient hoof care they need.